Curtin researchers believe that ancient supercontinents formed and then fell apart through alternating cycles spanning hundreds of millions of years that involved superoceans being swallowed and the restructuring of the Earth's mantle. 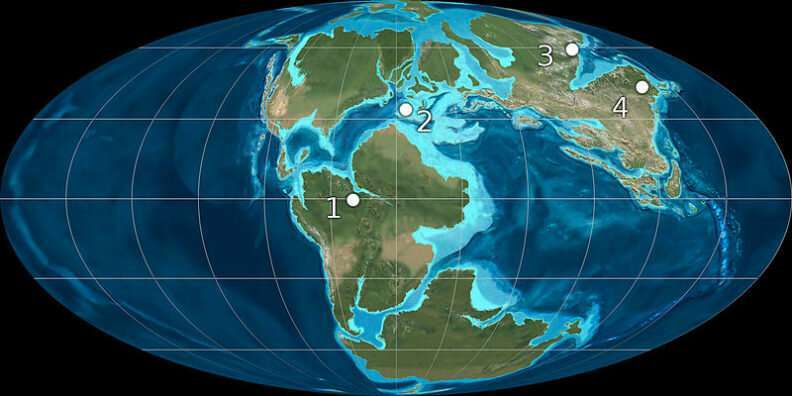 The latter process caused supercontinent Rodinia to be turned inside out by tectonic forces, thereby consuming the surrounding superocean and leading to the creation of Pangea, the supercontinent that incorporated almost all of the Earth's landmasses. Rodinia had formed via 'introversion' where the internal oceans formed during the break-up of previous supercontinent Nuna were consumed. Lead researcher John Curtin Distinguished Professor Zheng-Xiang Li, from the School of Earth and Planetary Sciences at Curtin University, said the assembly and break-up of supercontinents occurred in alternating cycles of about 600 million years. "In the past 30 years, researchers have discovered that Pangea-like supercontinents existed at least twice before Pangea, occurring roughly every 600 million years in what is known as the supercontinent cycle," Professor Li said. "More recently, researchers studying Earth's geochemical records and formation of mineral deposits identified even longer-term variations in these cycles but it was not known why." Professor Li and his team of Curtin researchers, funded by the Australian Research Council's Laureate Fellowship grant, recently discovered that the answer to this question could be found in the history of some of Earth's deepest oceans. "We found that supercontinents appear to assemble through two alternating processes of extroversion and introversion," Professor Li said. "More intriguingly, these two alternating processes determine not only whether the superocean survives, but also whether the circum-superocean Ring of Fire—like the present-day Pacific Ring of Fire – survives. "If the Ring of Fire survives along with the superocean, then the Earth's mantle structure maintains a similar pattern to the previous supercontinent. If not, then the mantle gets completely reorganised. "Such alternating ways of supercontinent assembly, along with the survival or regeneration of the superocean and the Ring of Fire, led to the presence of an Earth cycle twice as long as the 600-million-year supercontinent cycle and influenced the formation of some of the planet's resources." Is this just another version of the consumption of ocean crust to allow the 200 million year ocean floor? How does this work differ from or extend the well-known 'Wilson Cycle' ?? If it happened three or more times before - what is there to stop it from happening again? Everything gets recycled anyway - even Star material. It does sound a bit scary - even if the Earth isn't too close to that period. The mind would prefer for things to go on, as usual if not better. jeebus (route 666) granny, you actually are going to impel me to be nice to seu, in response to that gibberish, you just posted? here seu, just so you won't think better of me. A more detailed cycle than earlier models, as we learn more. From the look at the paper image thumbnails they don't have data from very many cycles though. I am not sure what you mean by "allow", but that supercontinent cycles depend on ocean crust being short lived. It can come and go as the more stable continental plates persist and assembles or disperses..
How does this work differ from or extend the well-known 'Wilson Cycle'? Seems to me they propose the continent formation and break up is organized around "superoceans" instead of happening in a more disorganized fashion. The added proposal of a mantle memory effect is interesting too. Your punctuations are still misplaced in the strangest ways, williejoe. You still place a question mark within a sentence that you have intended to continue after that ?mark which makes it appear that you are making an inquiry, and then ofttimes you place a period after another word and then continue the same thought with a capital letter after (seemingly) having ended the sentence already with the period. Uh is this some sort of way you have to gain attention? I would love to fly to Mars on holiday but for SpookyOtto's 900 foot tall glass headed Martians, which is worrisome, not only for SpookyOtto's delusions of giants living on Mars - but also that he might be right. You see, I have this allergy toward giants that might take it into their "mind" to step on and squash me. "A massive series of powerful earthquakes on a worldwide scale reduce towns and cities to rubble and plunge the few survivors into barbarism." This may be related to the long-term effects of the complex 'sutures' that form when oceans close and continental plates collide. IIRC, much of the Atlantic's opening paralleled prior coastline, more than you'd expect from the plates' old cratons. The Earth is a dynamic hotspot of movement both under and over the land surfaces and oceans - rollicking and roving movements of old and new crust, and with oceans under the crust where no one had previously expected to find such caves of water that time forgot. The water underneath the water. With every perceived movement of the planet's crust, humans will cower in fear of being swallowed up into the cracks that may appear in pavements, and where whole houses and the land around have disappeared into the hole that was made by the ground shifting and being swallowed up, and where furniture, pets and people are never again to be found. This is where we live. This is home. Love it or leave it.